What is Qianyang Ancient Town? Surrounded by water on three sides, Qianyang Ancient Town is located around 25 kilometers northwest of Hongjiang Old City. It is called “the first ancient town in West Hunan”. Qianyang Ancient Town has a history of more than 2,200 years. The old buildings in the Ming (1368 - 1644) and Qing (1644 - 1912) Dynasties stands across the town and local aborigines still live in the old town. Originally, there were five city gates. Now, four of them are still well-preserved there. The West Gate is called “Zhongzhen Gate” (中正门) as well. The county government office in feudal China, the academies, the Confucian temples, the Wuci ruins, the ancient inns, the pavilions, the ancestral halls and theaters in the Ming and Qing Dynasties are dotted around the old town. 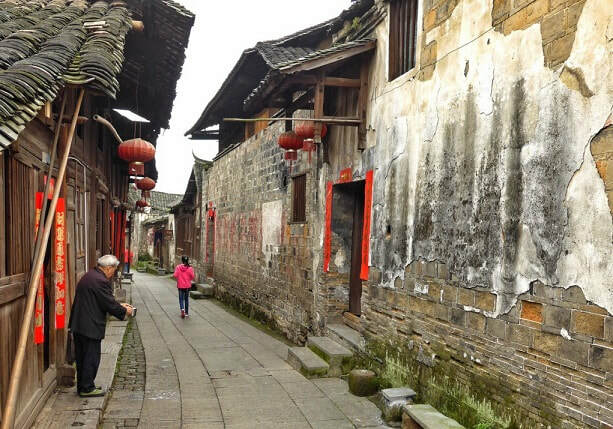 The Qianyang Ancient Town is dominated by the buildings in the Ming and Qing Dynasties. With the features of the local Dong and Miao buildings, they were built in a lot of red sandstone, bluestones, small blue tiles, fir, stone tablets. The architectural style is very distinctive. If interested, visitors can also explore the ancient tombs in the Spring and Autumn Period (770 - 221 BC) and the Western Han Dynasty (202 BC - 8 AD) in the Nantoupo of Yuhuangge Village, the hillside of Niutou Bay, and the hilly area to the north of the bus station. If you are planning to visit Qianyang Ancient Town for photography purposes or architecture study, it is worth visiting the town around the year. Certainly, the best time to visit it is in spring and autumn as it is not too hot or too cold during these two seasons. Although Qianyang Ancient Tow is not as popular as Fenghuang Ancient Town among tourists, there are directs buses from Huaihua South Bus Station (怀化汽车南站) to the town from 06:30 - 18:30 as at 6th July 2018. Therefore, there are several options. Rent a car from Huaihua or Hongjiang. This is the quickest and most direct option. Take a train to Huaihua from Wuhan, Beijing, Guiyang, Zhangjiajie or other cities. Then, take a direct bus from Huaihua South Bus Station to the town. Take a flight from Bejing, Guangzhou, Shanghai, Kunming, Haikou, Shenzhen or Changsha to Huaihua Zhijiang Airport. Then take a taxi directly to Qianyang. Alternatively, take the airport shuttle bus to Huaihua City. And take a direct bus from Huaihua South Bus Station to Qianyang. If you would like to experience the local life, it is recommended that you stay overnight in the town. Please book the hotel in the town as early as possible as there are around 15 inns across Qianyang Ancient Town as at 6th July 2018. Most of the inns are transformed from the old buildings. Interested in visiting Qianyang Ancient Town on a Tour? Wendy Wei Tours offers a variety of different packaged tours as well as custom tours including Qianyang Ancient Town, among other attractions and destinations. To find out more, please visit our Tours page or Contact Us directly to find out more.